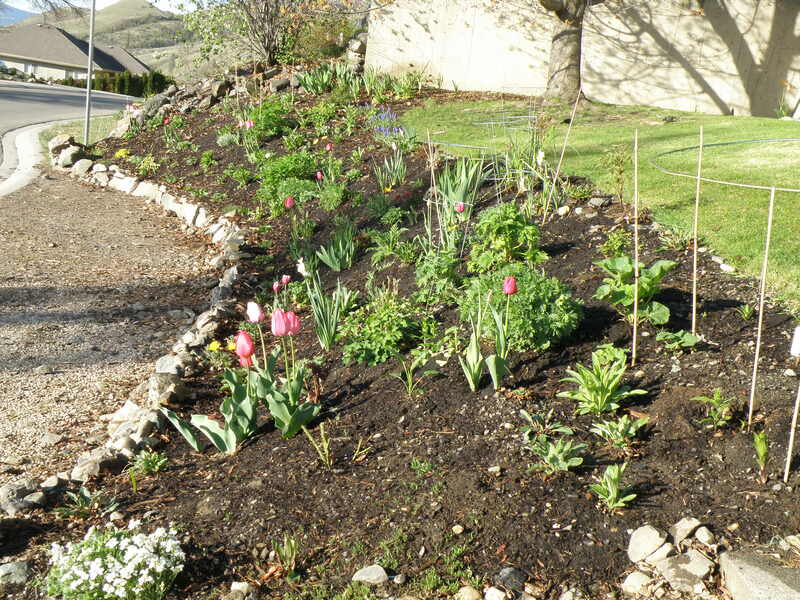 APART FROM WATERCOLOURS, a favourite hobby is planting and maintaining a perennial flower bed on the sloping embankment at the front of our home, which was first undertaken in 2010. THIS IS WHAT IT LOOKED LIKE at April, 2010. That was after having removed the cedar mulch which the previous house owners had in place. It took quite a bit of figuring out and planning as to what kind of perennial flower bed was even possible on an embankment dominated by a large red Maple with an extensive root system. Quite apart from the challenges posed by the Maple was the discovery that almost every foot of ground contained very large rocks. That’s them, winding around the edge. Planting a simple purchase of a few perennials always entails hitting rock. Finding the edges of it, then lifting the *#@*! thing out and replacing it with good earth and only then actually doing some planting is one of the joys of living in a very rocky region. On the plus side of having mountain skree as ‘soil’ is knowing there is no problem when it comes to needing excellent drainage. I have been stymied by how to post new additions to this page, whereby they get published for all to see once that happens, but I am going to just satisfy myself by adding to this to make one very very long page, with many paragraphs. This particular entry is devoted to the way the front garden looks in May.